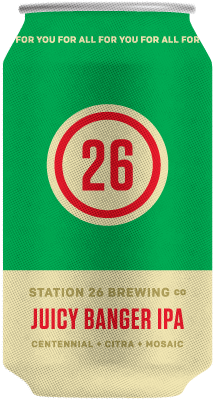 Station 26 Brewing Co. — STATION 26 BREWING CO. Brewed with Colorado-grown ingredients. Gluten reduced. A beer-wine hybrid brewed with Colorado malts, Gewurtztraminer grape must, and saison yeast for the wedding of Station 26 founders Justin + Annie. An unfiltered American wheat brewed with lemongrass and Lemondrop hops. Gluten reduced. A kettle-soured sherbert beer made withs strawberries, lemon, and vanilla. A summer crusher. Gluten reduced. Our amber ale has a complex malt profile with a balanced hop character. A classic English-style bitter. Biscuity undertones, and a smooth finish. Yet another hazy IPA that comes off smooth and juicy. Check the board for the day's variant of our Bourbon Barrel Aged Dark Star Imperial Stout. Our double IPA was aggressively hopped at multiple stages during the brew. Aromas of orange peel and Meyer lemon. Finishes dry. A highly drinkable stout with modest fruit notes and a strong roasted character. This is just a sampling of what's been on tap this week. Actual beers may vary. You'll like what we have though. Colorado Cream Ale plus tangerine and vanilla bean. Citrusy and sweet and perfect for summer! Our double IPA was aggressively hopped at multiple stages during the brew. Features flavors of orange peel, pine, and Meyer lemon, and finishes dry. A balanced amber ale with a complex malt profile and a bright but modest hop character. Come see the brewery. Come taste the brewery. Do you serve food? Yes! Order 26 Food Truck is parked outside the brewery from 3:00 - 9:00 p.m. every day. A New American Mobile Diner, Order 26 serves up delectable mainstays and sweet specials that change often. Look also for special event menus and popups. Do you have a gluten-free beer? Our Colorado Cream Ale and Tangerine Cream are crafted to reduce gluten. Do you allow dogs? Yes, out on the patio. Do you allow kids? Yes, the well behaved ones. Are you hiring? No, not at the moment. When is Bluegrass Brunch? The second Sunday of every month, beginning at 11:00am (two hours earlier than other Sundays).